About a month ago I joined the site and said "I don't have a bike yet, but I'm looking!". Well, one finally found me and took me up on my offer to live in my garage. 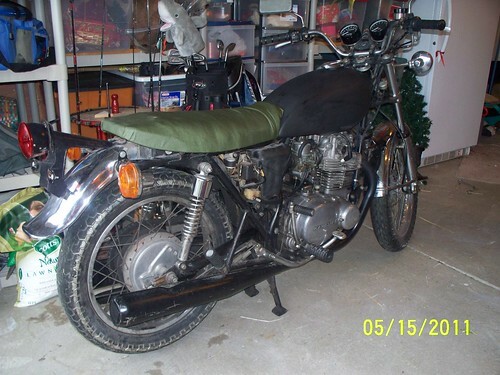 I picked up a 1976 KZ400 D3 last Thursday with about 14K miles on it. She's kinda ugly right now and pretty grimy but she's got good bones. Forks tubes look brand new. Front and back wheel look like they will clean up really nice. 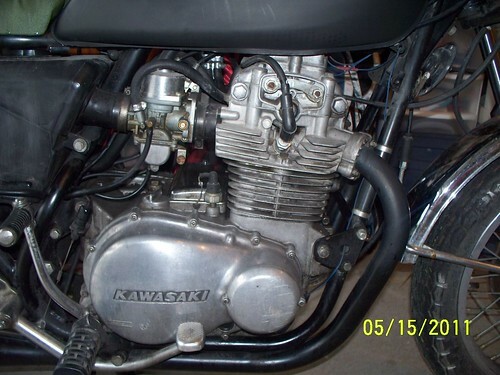 No scratches or anything on the engine and it looks like it will polish up really nice. No major rust to speak of anywhere. Doesn't look like it's been messed around with too much - most everything looks stock still (but not for too long - muahahaha). All the lights, horn, etc. seem to work fine. Tires are okay, should last this year but I wouldn't trust them in the rain. It runs fine but PO says it is missing at high RPMs so I may be looking for a set of diaphragms soon, but I'll know more once I get into it. Need to get it cleaned up first (I can't stand working on a dirty car and I already dislike working on a dirty bike), get some plates on it and get it on the road. I was dying to push it out in the yard and get busy with a can of degreaser, some brushes and and the water hose, but with the crappy weather we've had it was a week before I had the chance. I made a first pass Friday night and got most the big stuff off. 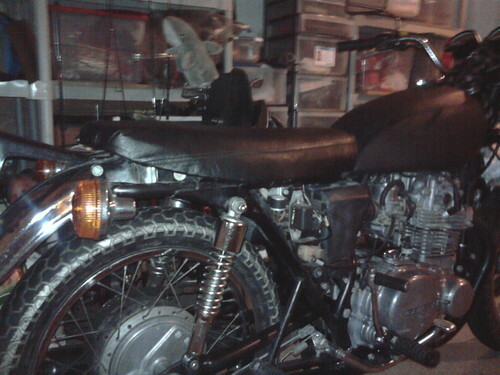 I'll make another tomorrow and she should be fairly clean then so I can get started polishing aluminum and chrome bits. 1. Replace the OD green piece of tarp currently used as the seat cover with something more appropriate. My plan is to get it running and leave it mostly stock for this year (though maybe switch to clubman bars) and then I'll start modifying after that. 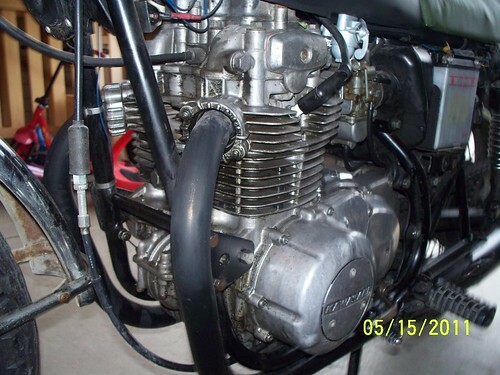 I don't know if I'll go all the way down to the frame this winter, I may wait until I need/want to tear the engine down before I take it down to the frame. By next summer I definitely want it to have a little more of a cafe look and just look cleaner. I'll replace the front and rear turn signals for something smaller. Replace that God-awful brake light assembly for something smaller. Probably go with clubman bars at first, do something with the seat and clear out the "triangle" - move the battery and electronics somewhere, switch to pods, etc. I'll get some new headlight ears and lower the headlight a bit and then lower the front end an inch or so. Not sure yet what I'll do with the front and rear fenders. I like the classic look of the front one but I may trim it down some. The duck-bill rear fender is growing on me so I may keep it, but I also like the look of the KZ400s that only run the inner fender too. I don't plan on getting too crazy or spending a lot of money I just want something that is fun to ride, that looks nice and different, and that I'll be proud of. 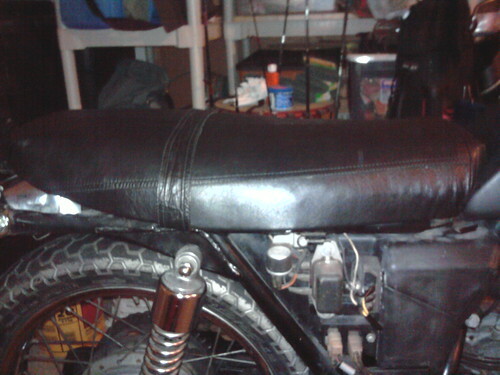 This evening I replaced the OD Green tarp seat cover with something a little more appealing. 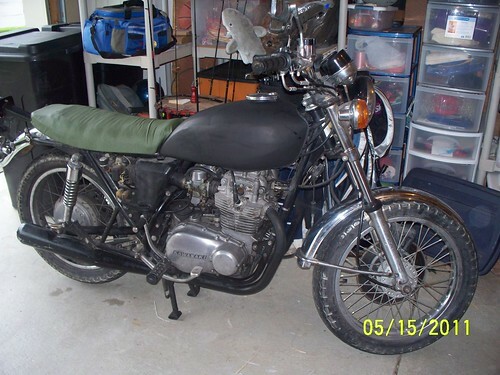 The PO said that when he got the bike earlier this year it had a seat cover made from duct tape so he replaced it with a piece of an old Army bag that he had sitting around. 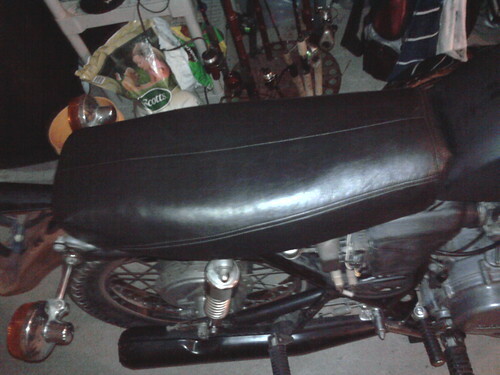 I figured if he could do that then I ought to be able to replace his cover with a nice piece of leather or vinyl. One of the previous owners had shaved the seat foam a bit, making it a bit slimmer and flatter. I didn't mind the look too much. It seemed to have a pretty good shape. I made a trip to a local Goodwill store and came home with a girl's long black leather duster for about $7 that looked to have more than enough material for the seat. As an added bonus it had a quilted liner that I could also use to add a little more padding. 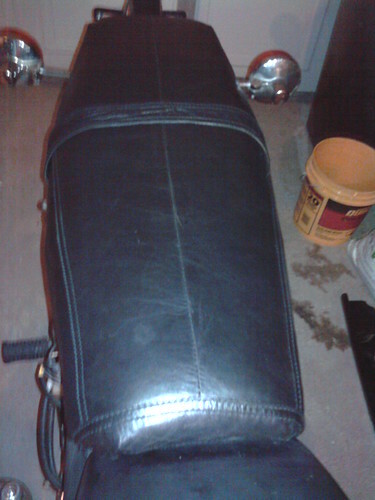 It is some really nice, thick leather and looks/feels kind of "old" but is in great shape. After taking a pair of scissors to it and a couple of hours worth of work I was very pleased with the end result. In some of the pics I have a strap across the seat that I'm thinking of adding. I like it with the strap, I think it looks period correct, but my wife and daughter disagree and think it looks better without. What do you all think? 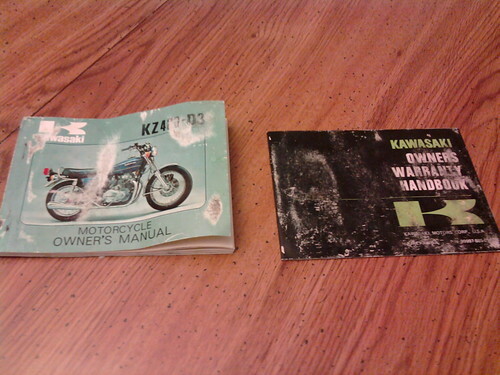 I was surprised to find the original owner's manual and warranty booklet in the pocket under the seat! Looks good Dan! I really like those pipes. The leather looks good. I'm not sure about the strap... i'd have to see it in person. Let's ride sometime soon.